Valegro is certainly a dream horse! A big mover, such a lovely face and that special color! I am really a big fan of him and Charlotte. 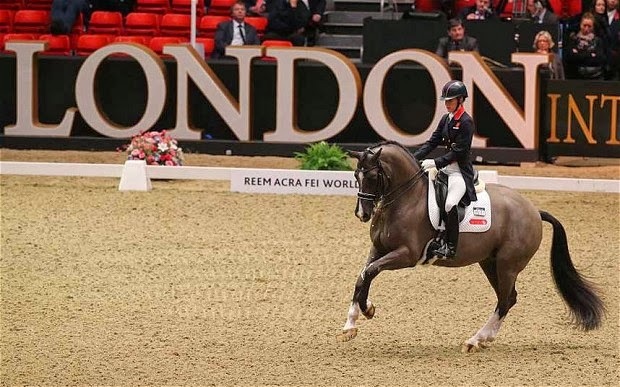 Have you seen this week's GP Freestyle at London Olympia Horse Show? She scored a 93.975% (stunning! ), breaking Edward Gal's record of 2009 (92.30%). 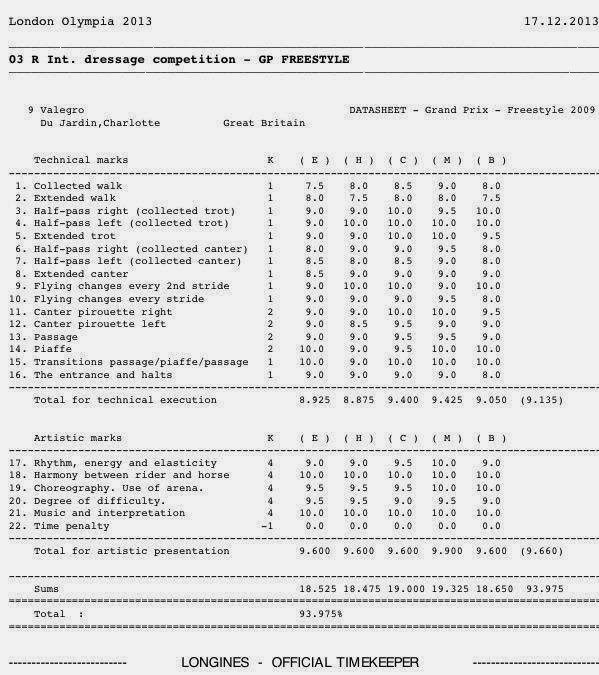 This is not the only record this pair is currently holding: Grand Prix 85.94% (Herning, European Championships 2013) and GPS 88.022% (Hagen, 2012) are in their hands as well. This is absolutely breathtaking and giving me goosebumps. One of the judges even gave her a 99%. In dressage, we learn pretty soon that there is no perfection as we are hunting it day by day and never reach it. But this couple is pretty close I would say! I’ve decided if Charlotte and Valegro can score a world record, I can better myself too. - Thou shall rename thy horse after fruit to achieve glory. Since Valegro’s barn name is Blueberry, I am thinking Gooseberry is a good name to start with. - Thou shall no longer just aim to stay in the arena and hold on to the holy neck strap for dear life, nooo… Thou shall score 10′s and only 10′s. After all, it’s only 6 numbers up from what we normally score! Thou shall look the part and don bling brighter than the brightest sunrise and wear Charles Owen halos on their head (After all, they must be epic as they support HJU!)…. However, this one I may achieve through writing to Santa/ begging the bank manager. Thou shall ensure thy horse is as black as the midnight sky…. This one is easily achieved in under 60 seconds via turning your horse out without a rug into a muddy paddock! Thou should work with music that expresses thy’s horse to the best level …. If Valegro works to music such as Land of Hope and Glory, perhaps we should work to Humpty Dumpty or Three Blind Mice? If Thou fails, Thou should seek guidance and forgiveness…. aka options could include: stealing Valegro and a few show jumpers (if you’re going to the effort you may as well go all out & get a good string! ), abducting/ stalking Mr Hester or take up knitting as your new hobby!